When a cast iron component is broken or cracked as a result of misuse or overload, a decision must be made whether to repair or replace the cast iron component. If the decision is made to repair the component, one should consider using the cold stitching process as performed by Metal Surgery. Dampens and absorbs compression stresses and spreads tensile strains. Provides a good expansion joint for such jobs as cylinder liners. Distributes the load away from the fatigue point. Maintains relieved conditions of inherent internal stresses where cracking occurred. Provides a low coefficient of expansion against repaired metal. Maintains alignment of original surfaces and obviates machining. 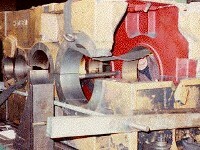 Work can be done on-site with subsequent savings in time and dismantling. Metal Surgery utilizes expert technicians to perform the repairs. Our process is a proven one with no record of failures. We are not in the business of selling stitching components or schooling outside future practicians. We believe that a reliable repair requires experienced technicians and good engineering know-how. Metal Surgery warrantees its repairs. Our cold stitching process has been granted approval under ISO9001 Standard. A Brief Description of the Process for Crack Repairs After determining the extent of cracking, lines of holes are drilled at right angles to the crack. The holes are then converted to slots by connecting the holes. Preformed locks are inserted in the slots forming a connection across the crack. Then holes are drilled along the crack line between each stitch. These holes are tapped for placing special screws to fill the crack. The stitched area is ground to conform to the base metal contour, thus completing the repair. Most metals can be stitched when welding is not feasible.